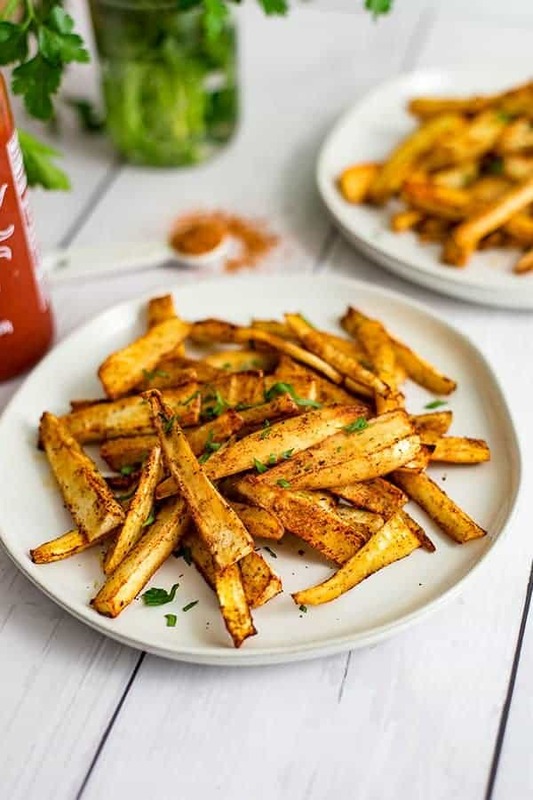 These cajun parsnip fries are one of our favorite side dishes! Turning veggies into fries is one of my favorite ways to make foods more exciting! 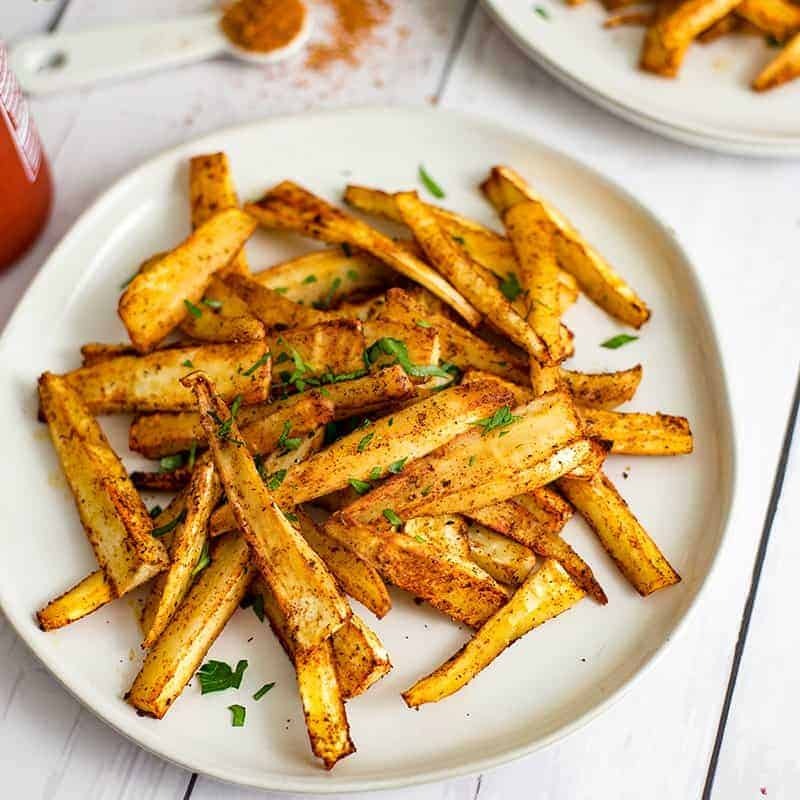 These cajun parsnip fries are vegan, paleo, Whole30, and low fodmap. As you may know, I’m a little obsessed with fries for dinner, but who isn’t! If you have never had parsnips before, this is the perfect opportunity to try them! 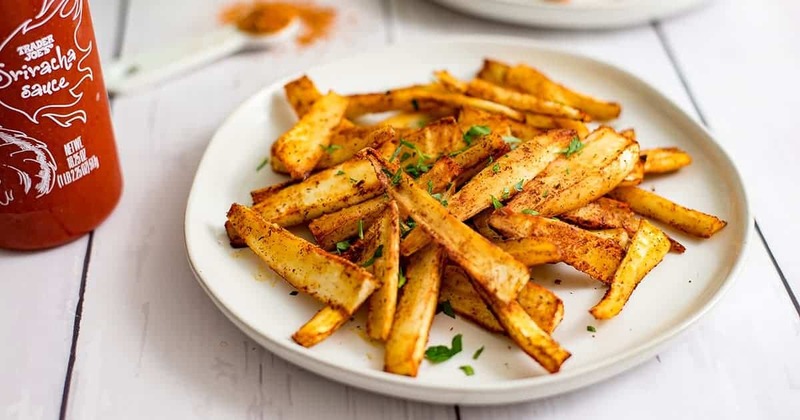 These parsnip fries take about 30 minutes and bake in the oven, making them a healthy, simple side dish that everyone in the family will enjoy! This year we vowed to try everything we could to help Dave deal with his digestive issues. He has been eating gluten free, dairy free, nut free and avoided most grains for almost 3 years. Although he has had some relief with these ways of eating, his stomach was never getting 100% better. His GI doctor recommended that we try the low FODMAP diet (which is essentially removing all fermentable carbohydrates from the diet). I was initially terrified of what to make him. 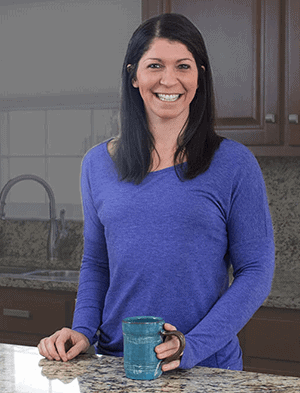 Low FODMAP diet cuts out things like garlic and onion, as well as garlic powder and onion powder, so most of my go to spice blends were off limits. 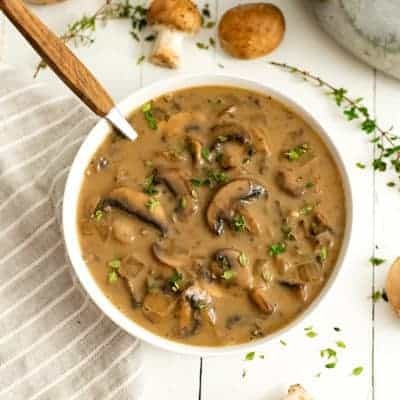 Although there are many gluten free grains that are allowable on FODMAP, most of them caused him a ton of GI distress so he was limited to eating pretty much potatoes for every meal. This quickly got old and I was looking for new ways to get him some healthy carbs. 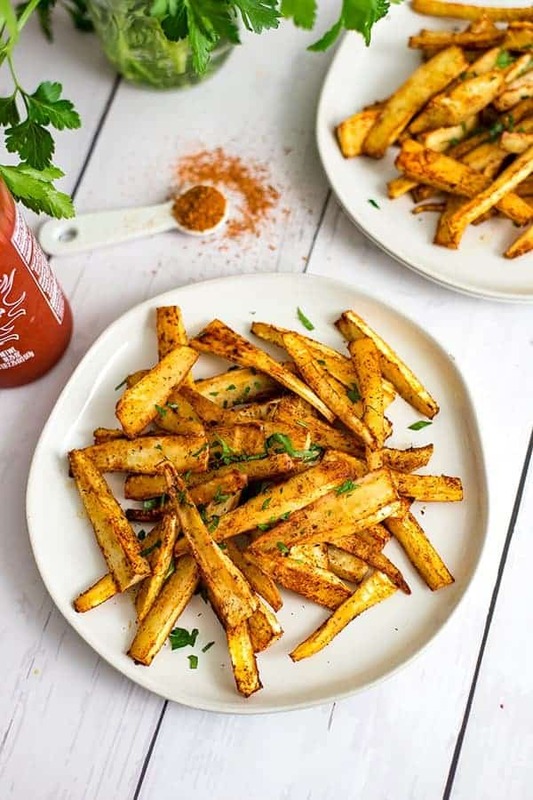 I was already making carrot fries pretty regularly so these cajun parsnip fries were an effort to make something similar with a different flavor profile. If you have never had a parsnip before, they have a little bit of a kick to them, so they are a fun change from regular old potatoes. 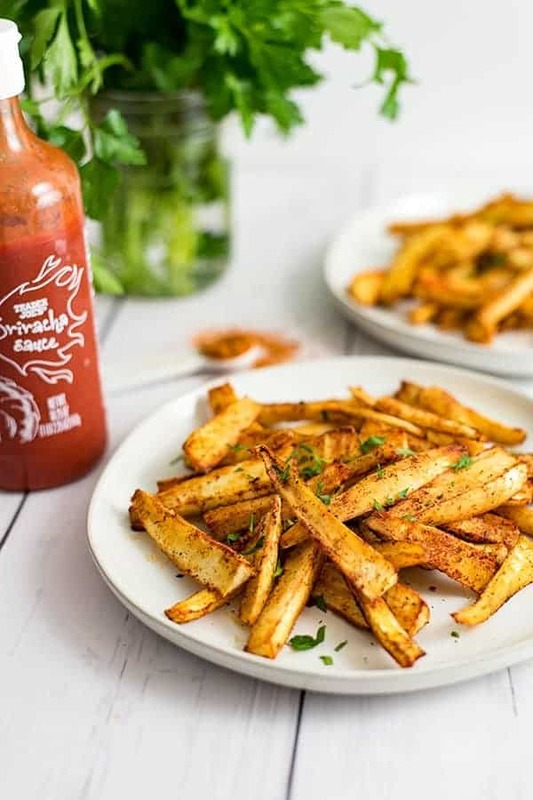 If you don’t have issues with onion or garlic powder, these cajun parsnip fries are even easier to make, just use your favorite Cajun seasoning (affiliate link) and peeled and cut parsnips. No need to measure out ingredients if you have a seasoning you love. 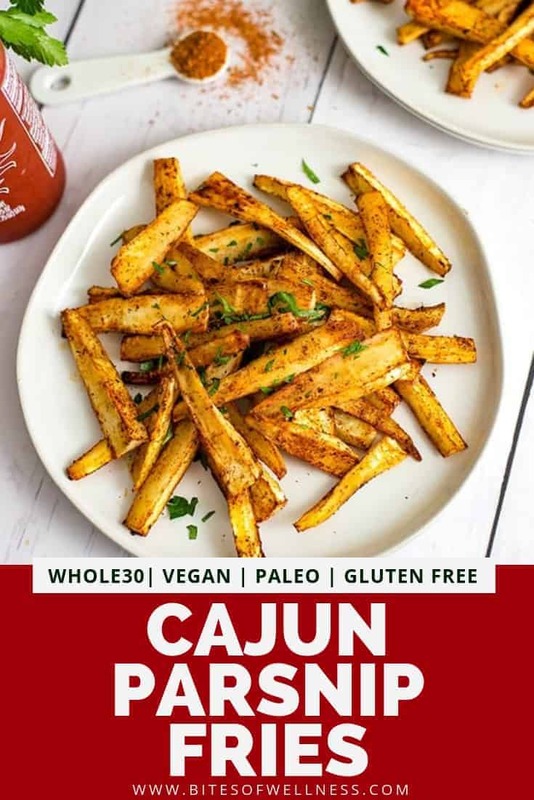 But if you are following a low FODMAP diet, the cajun seasoning below is great on chicken, fish and other veggies as well so make double or triple the recipe and save it in a glass jar for later! I use fresh whole seeds for this recipe and grind them in our Ninja Bullet blender. If you have a coffee grinder for spices you could use that as well! If you are hesitant on buying whole seeds, remember that stores like Whole Foods, Earth Fare and almost every health food store has areas where you can buy seasoning in “bulk” where you can buy just a tablespoon or two at a time. This is how I used to buy spices when I first started cooking! Peel the parsnips and cut them into fry shapes. First cut the top and the tip off the parsnips. Then cut them in half (dividing the top and the bottom). From these halves, you will want to cut these in half the long way. Cut them in half or third again, making fry shapes. Try to keep all the fries about the same thickness so they cook up the same time. Place a sheet of parchment or a silicon liner on the baking sheet. Add the parsnip fries. Pour the garlic olive oil, 1/2 tsp. of salt and 2 tsp of cajun seasoning over the fries. Stir with clean hands until the fries are evenly coated. Place the fries in the oven for 17 minutes at 450F. Take them out and stir them around. Return to the oven for an additional 7 minutes. Remove from the oven and serve hot! 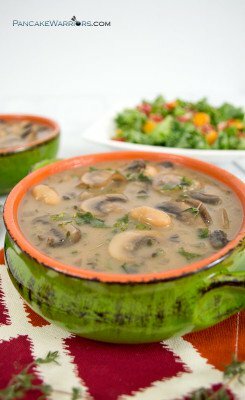 The perfect alternative to french fries! My family loves these. Oh yum, I love parsnips but often get stuck in rut and always end up roasting them. This is a good alternative!